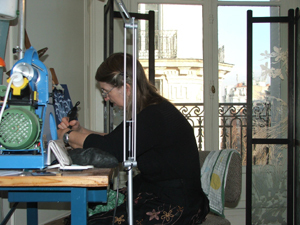 Having worked for some time in London, I have now moved my studio to the north of Paris. where I enjoy the light of a fifth floor classical parisian apartment. I'm about 50 metres south of Porte de Clignancourt métro, 5 stops from Gare du Nord, so if you are planning a trip to Paris and have an hour or two to spare, you can see my work in progress. Please telephone 01 42 55 61 18 beforehand to make an appointment.